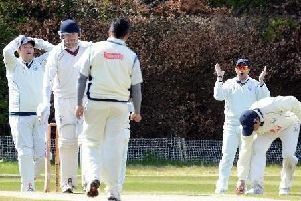 Uddingston Cricket Club’s positive start to this season’s Western Union Premier Division has fans dreaming of another title triumph. The Bothwell Castle Policies outfit currently sit second in the table after winning three of their first four league matches of this campaign. So club captain Bryan Clarke and his troops are in a confident frame of mind ahead of this Saturday’s trip to Dumfries, noon start. Wicket-keeper Bryan (37), who has served the club for 25 years, said: “After finishing fifth last season, we are probably a wee bit ahead of where we thought we’d be this time. “I think if we did end up winning the league then it would probably be a good time for me to stop playing! “But I don’t think we have any expectations of winning the league at this point in time. “What we want to do is compete in this division, which we are doing without actually playing that well. Uddingston’s latest win on Saturday saw them score 152 in the home clash against Kelburne, largely thanks to respective knocks of 50 and 38 by Gavin Bradley and Harry Singh. The Lanarkshire side then bowled out their opponents for just 99 to win by 53 runs. The high number of weather related postponements has meant the current league standings are calculated in percentage terms, with Uddingston just two per cent behind current leaders Ferguslie. After a 79-year drought following Uddingston’s league title win of 1934, the club finally came top of the pile again in 2013. But the loss of key men Calum MacLeod and Gavin Main – both of whom went on to play professional cricket for Durham – hit Uddingston hard and recent years have been all about a rebuilding job. “Obviously we are not at the level of that 2013 title winning team just now,” Bryan added. Uddingston’s efforts this season have been helped by the arrival of international spin bowler Ross Lyons who has arrived from East Kilbride. He has been effective on both the bowling and batting fronts. Uddingston 2nd XI are at home to Dumfries this Saturday, noon start.